Help Santa collect the Christmas bling! in this fun side-scroller! Spacebar = Bunny hop to jump over ice patches. While in the air, use the arrow keys to flip and rotate. If the trick bar is full, press the up arrow to boost your speed! Are you ready for the most exciting and chilling adventure of your life? 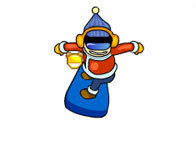 If so play snowboard challenge! Roll a snowball down a hill for as long as you can, avoid anything bigger than you and swallow up anything smaller, all in 3D! Clear the snow with your trusty and super loud Snow Blower. Avoid Grumpy Joe who wants his shut-eye and will stop you if he can! Hit the slopes and kick out some tricks with this fun, realistic ski simulator. Do combo's for extra points and slalom your way from level to level! Snowboard, skate and fly! Collect musical candy canes to advance to the next level! Are you ready for a race? Try out this funny addictive penguin slalom ski game for all ages!